Preheat oven to 350°F. Line 2 cupcake pans with 24 paper liners. Bring stout and butter to simmer in heavy saucepan over medium heat. Add cocoa powder and whisk until mixture is smooth. Cool slightly. Whisk flour, sugar, baking soda, and salt in large bowl to blend. In the bowl of a stand mixer with the whisk attachment (or with an electric mixer), beat eggs and sour cream to blend. Add cooled stout-chocolate mixture to egg mixture and beat until combined. Add flour mixture and mix on slow speed until just combined. Let batter rest for 15 minutes. Fill cupcake liners generously (a little more than ¾ full). Bake cupcakes until tester inserted into center of cakes comes out clean, about 17-20 minutes. Cool in pans for 10 minutes. Turn cakes out onto rack and cool completely. Frost with Irish Cream buttercream when completely cooled. Cream butter in the bowl of a stand mixer (or in a large bowl with an electric mixer) until light and fluffy. While butter is creaming sift powdered sugar in a large bowl. Add sifted powdered sugar one cup at a time to creamed butter (use the lowest setting on your mixer until all of the sugar in incorporated and then increase speed to medium-high and beat until buttercream is smooth and fluffy). Add the Irish Cream and beat until incorporated. Hand frost each cupcake and decorate as desired or to make them look “Trophy”, place the buttercream in a pastry bag fitted with a large round tip. Make a swirl of buttercream on each cupcake and sprinkle with clear sanding sugar and top with a lucky sugar shamrock. 1. 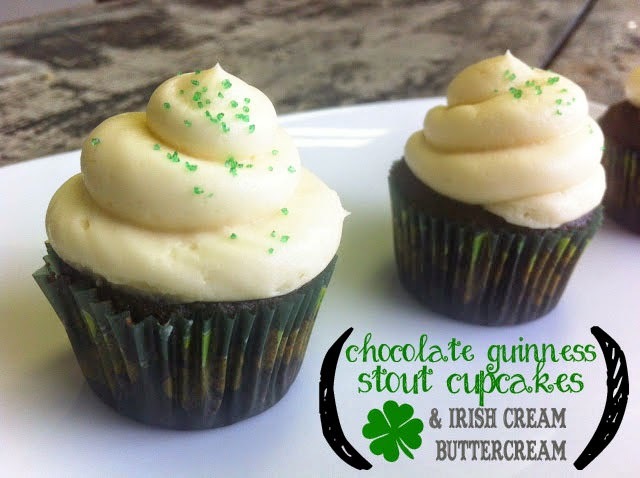 Chocolate Guinness Stout Cupcakes with Irish Cream Buttercream - As I'm sure you know by this past weekend's festivities, Tuesday is St. Patrick's Day. In celebration of the holiday, I have chosen one of my favorite recipes, Chocolate Guinness Stout Cupcakes with Irish Cream Buttercream as one of this week's obsessions. Check back tomorrow for more details on this recipe! 2. Unbreakable Kimmy Schmidt - Netflix's latest original series and my weekend's tv binge; I watched all 13 episodes in one day, guilty. 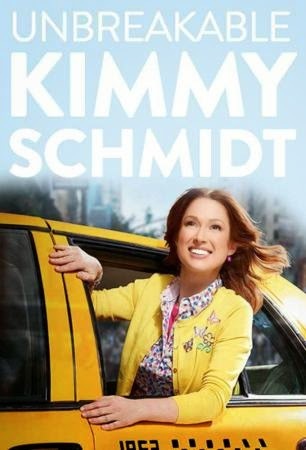 Created by Tina Fey and staring Bridesmaid's Ellie Kemper, you're sure to be entertained. 3. Lazy Bear - One of San Francisco's hottest restaurants and most sought after reservations right now, Lazy Bear features a tasting-menu only set in a communal dining style. Tickets go on sale the month prior and sell out in about 10 minutes. Tickets for April happen to go on sale TODAY AT NOON (PST). Although I haven't been, we've got tickets for this week's dinner so I look forward to sharing more soon! 4. Green Skirt - In following with the St. Patrick's Day theme, I wanted to find an outfit for Tuesday so obviously I went straight to Pinterest. Although I found lots of fun options I love this knee length green skirt which can be paired with just about anything - perfect for Tuesday's festivities. 5. SF Flower Mart - My obsession with flowers continues as I made another trip to the SF Flower Mart this past weekend. This weekend's haul included pink, white and yellow runaculas as well as white roses. I also snapped this photo while standing in a "field" of runaculas. Happy Monday! I hope everyone has a great week. Until next time! That is until last night. The stack of menus is still there, growing, but I finally feel inspired again. And, surprisingly enough, it wasn't because of a meal I had eaten; it was because of flowers, flowers and eggs. So, in an attempt to share my latest inspirations or rather obsessions with you, I've decided to (try) and do a weekly column titled "Monday Obsessions". Each week I'll feature the things that are inspiring me right now - it may be food, or it could be clothes, I'm not really sure but I hope you'll enjoy them as much as I do! So, without further ado, I give you my first Monday Obsessions. 1. 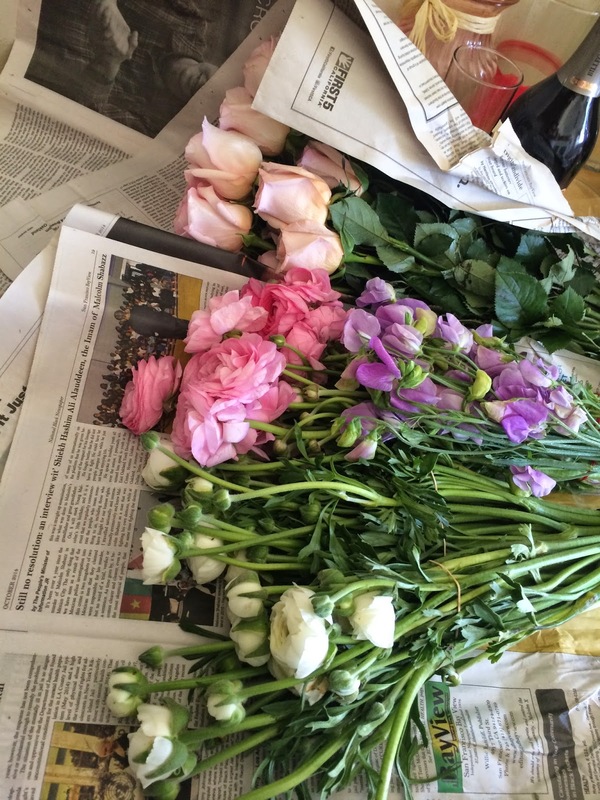 Ranunculus - Spring is in full bloom and that means flowers, and lots of them. Traditionally my favorite flower has been the peonies but after a trip to the SF Flower Mart this weekend I fell in love with ranunculus, they're almost like a mini peonies! 2. 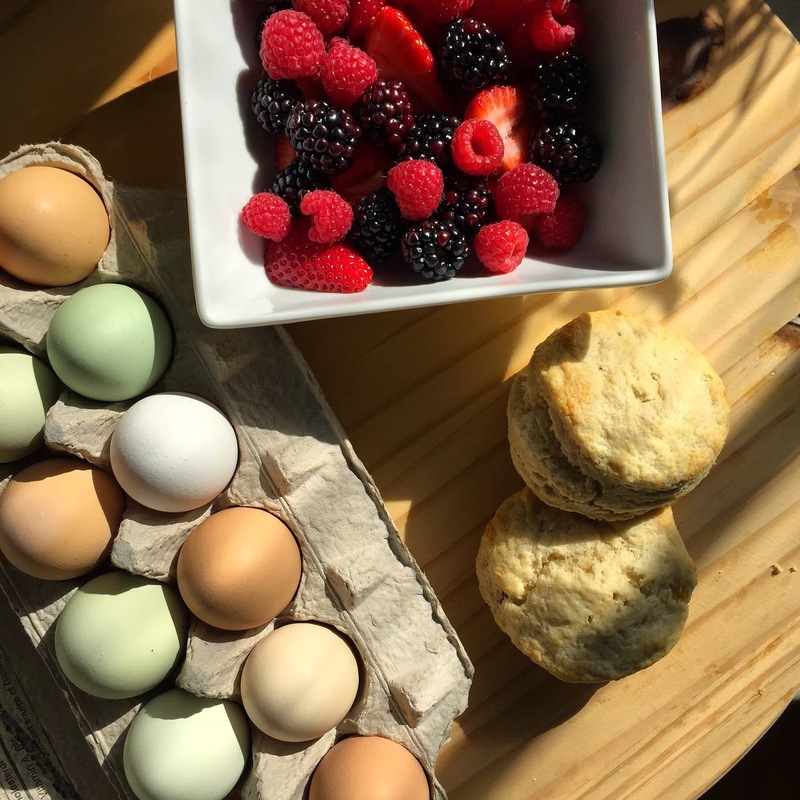 Farm Fresh Eggs - I've been going to the Marin Farmer's Market the past few months but typically don't buy much. I recently picked up a dozen eggs to bake with and instantly fell in love with them. The color, outside and while used in baking is amazing and they really do improve the taste and quality of your final product! 3. Biscuits - Something I have always loved but don't typically make, until this weekend. I had some extra buttermilk and was craving something sweet and somehow landed on buttermilk biscuits. I found a fantastic recipe from Smitten Kitchen and whipped them right up. I ended up freezing some of the biscuits so we were able to have them throughout the weekend! I highly recommend making these and freezing them for when you want fresh biscuits next! 4. Braided Buns - I've been watching a lot of the show Viking, on the History channel, lately. If you've ever watched the show you'll know the women wear their hair in braids, a lot. I love a good fishtail off-to-the-side-braid but typically don't do much else. I was scanning Pinterest this weekend and came across this gem. As my hair was slightly (okay pretty) dirty by Sunday, I needed something to do with it. 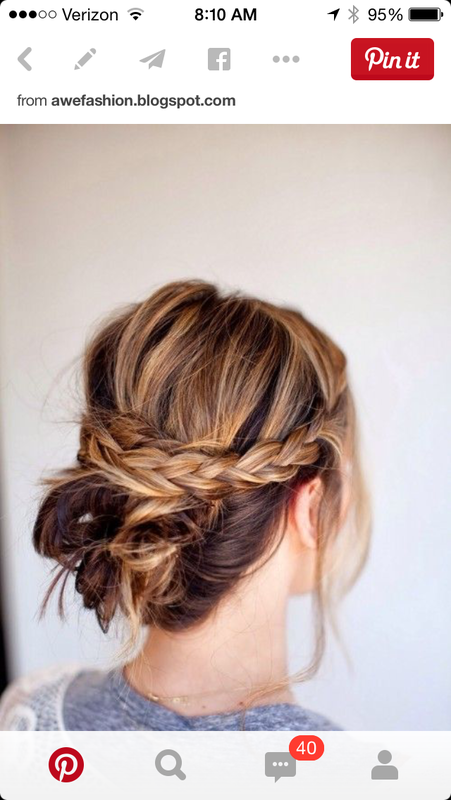 So I tried this do and instantly fell in love - easy and perfect for all occasions! 5. Shark iPhone 5 Case by Stella McCartney - I love sharks. I may not want to run into one while swimming in the ocean but I wait all year for Shark Week - who doesn't? I even have a Shark Week Pinterest board...okay maybe that's taking it a little too far. 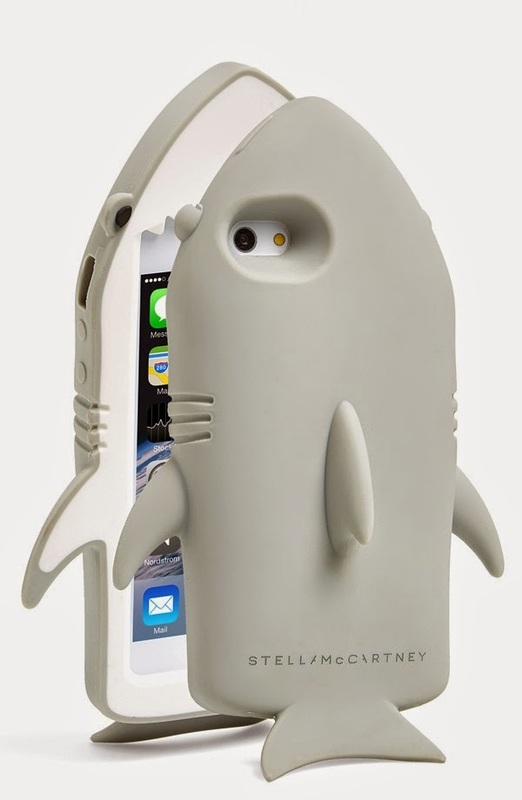 But I do love this Stella McCartney Shark iPhone 5 Case. Unfortunately mine has been on back-order since January but doesn't mean I have to love it any less! Dessert Pocket is a blog all about celebrating the sweetest moments in life. Madison + Bunny blog about their baking, cooking, and travel adventures while on a constant sugar high.